We slept a bit on the crossing, stretching out on the floor next to our seats as there weren’t many other passengers. 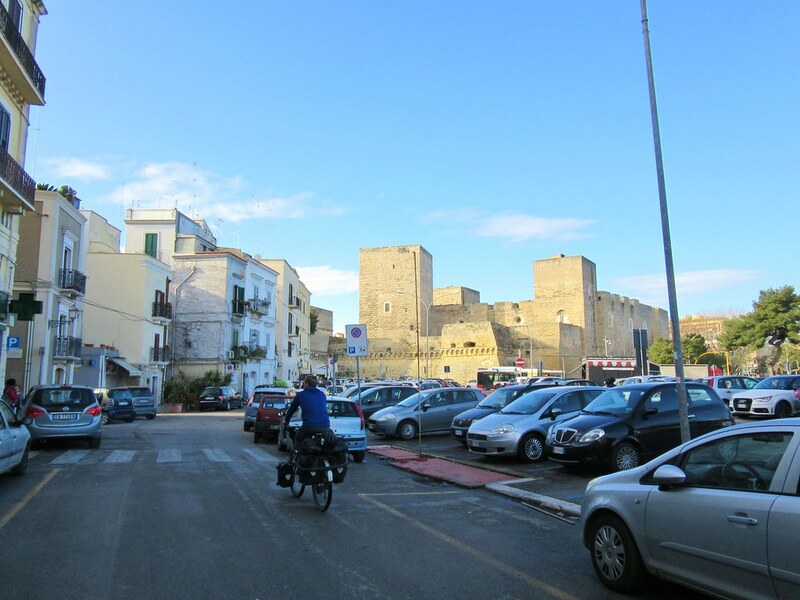 The timings worked well as we arrived in Bari at 8am, ready to set off for the next days riding. As most of the people on the boat were from Albania, the queue for the non-EU passports was really long, blocking the whole entrance way to the terminal. We were able to skip past the line to get to the EU window. How much longer will we be able to do that..? 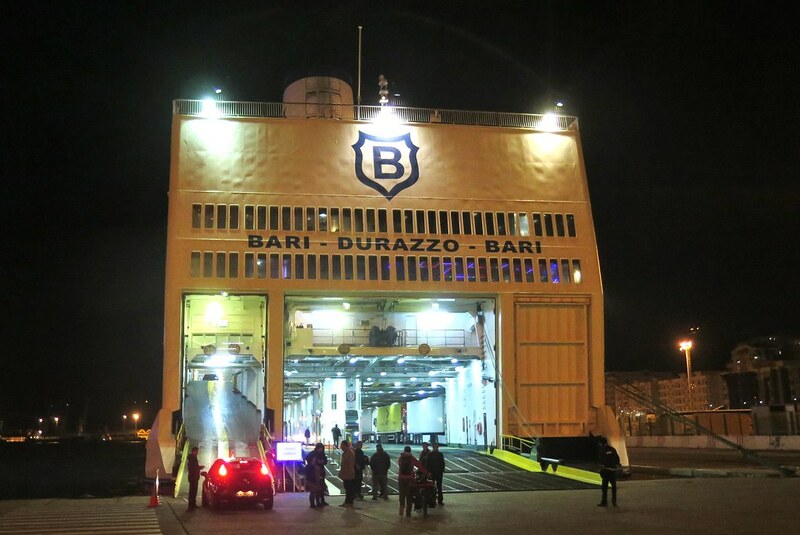 Our bags were then all X-rayed and we were asked a few questions about where we’d been by the customs officers, but we were soon out and straight into Bari’s old town on the look out for an ATM and a coffee. 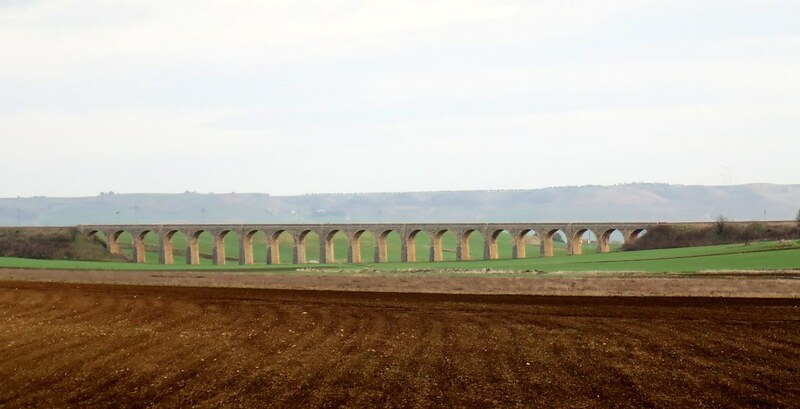 It was easy enough leaving the city, cycling west into the countryside. 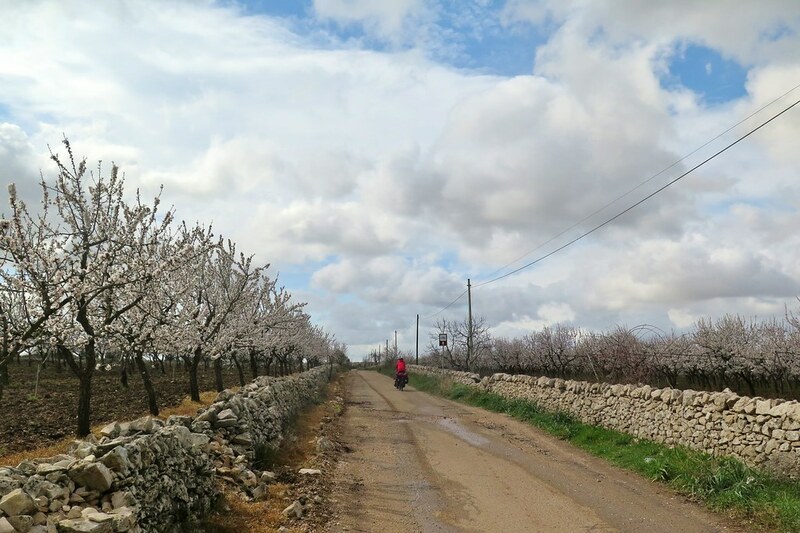 Once we were out of the ‘burbs we were surrounded by olive groves and almond trees. The almonds were all in blossom, they’re the first tree to bloom in the spring apparently. 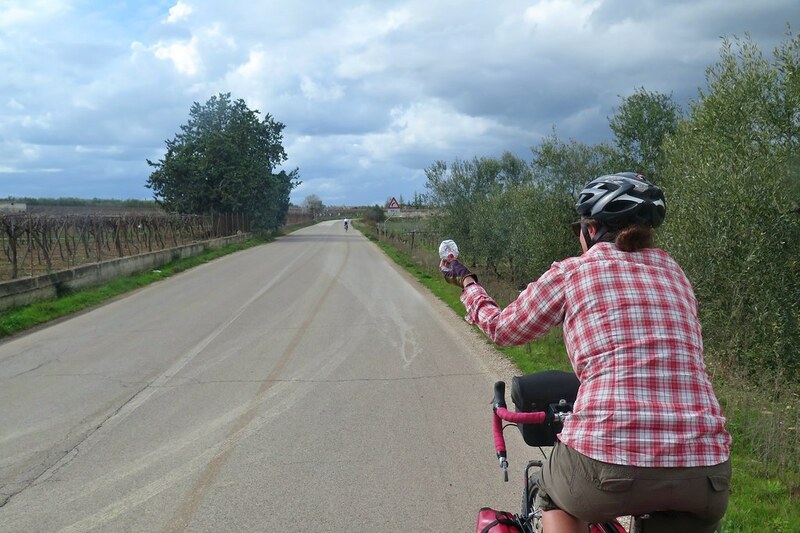 We headed roughly towards Ruvo di Puglia, looking for the quietest roads we could find. It worked most of the time, but at a couple of points we had to backtrack or ride a couple of kilometres on dusty farm tracks. On the better roads, we were passed by quite a few road cyclists. 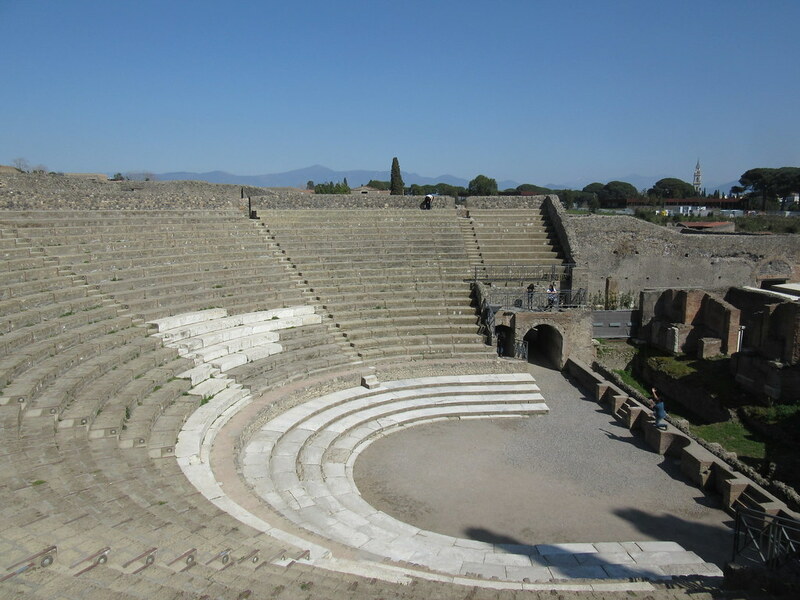 They gave us the odd wave or nod, but generally our ‘buongiorno’s and ‘ciao’s weren’t returned with much enthusiasm. Until one lovely guy slowed and passed us each a little biscuit from his saddle bag, then zoomed on ahead. Grazie mille! We were slowly climbing up into the hills, through a national park to where we had arranged to stay with a Warmshowers host, Valentine. 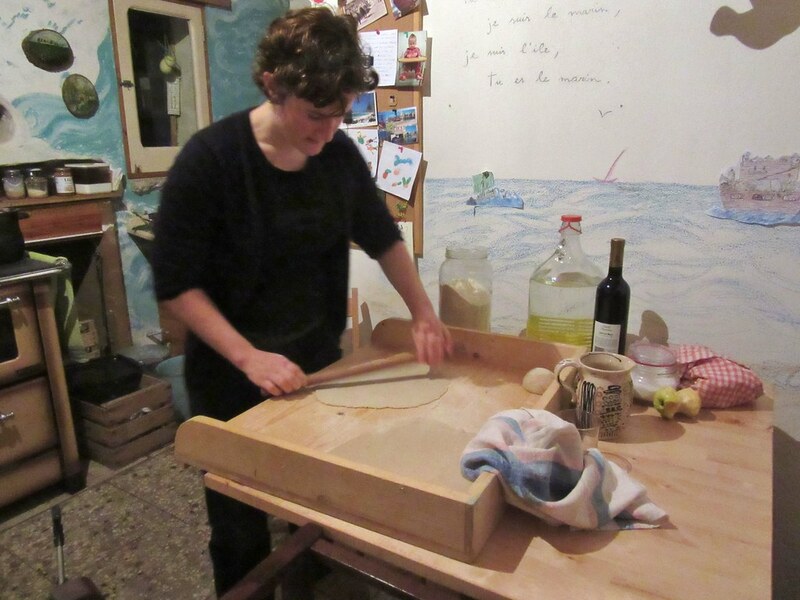 She’s French, but lives in Puglia with her Italian husband, his family and their 3 year old, multilingual daughter Elena, on an organic ‘Agriturismo’ farm. They grow and rear almost everything they eat, including the grain they used to make the delicious pizzas they served us that evening for dinner. We were able to sleep in one of their farm buildings, staying warm and dry as it rained that night. 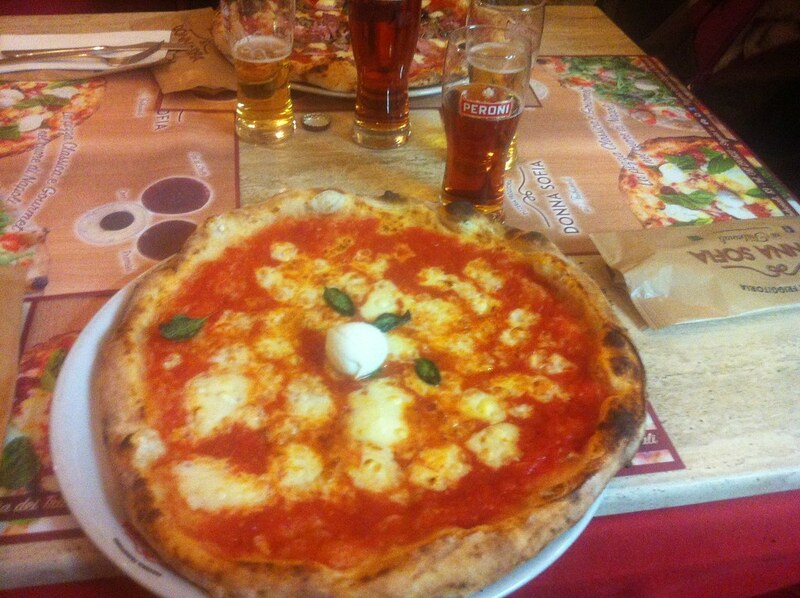 It was a good start to Italy. 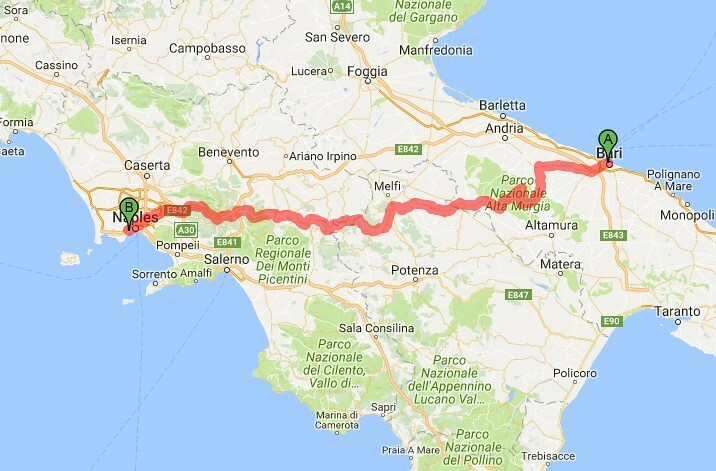 Valentine gave us some directions and route advice for working our way towards Napoli, sending us on our way with some homemade cherry jam. Unfortunately, with the overnight rain, one of the dirt roads had turned to mud. That really thick mud that comes from the rich soil you get in farming areas. It was only a short stretch, less than a kilometer, but our wheels were completely clogged up and we were unable to ride. 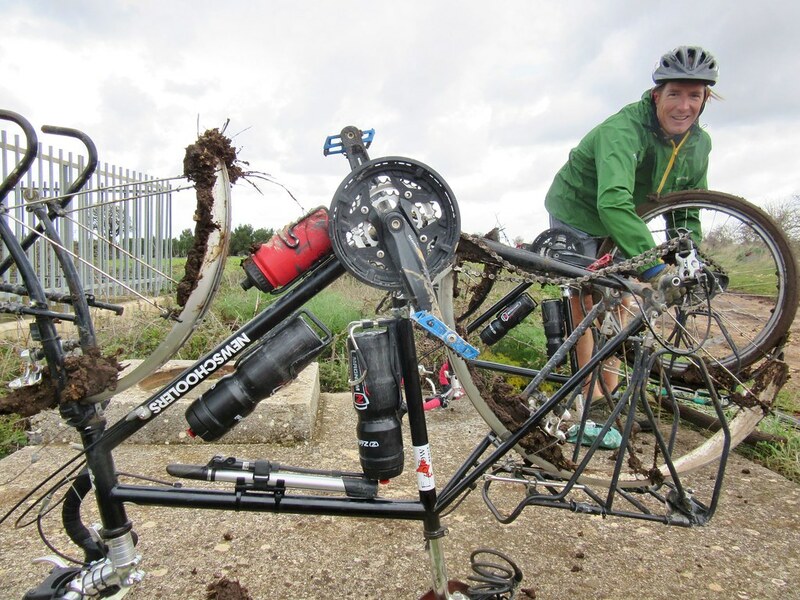 We pushed the rest of the way back to a sealed road and then spent an hour scraping off our mudguards and chains. Then the obstacles kept coming, with steep climbs and a strong headwind slowing our progress through the day. 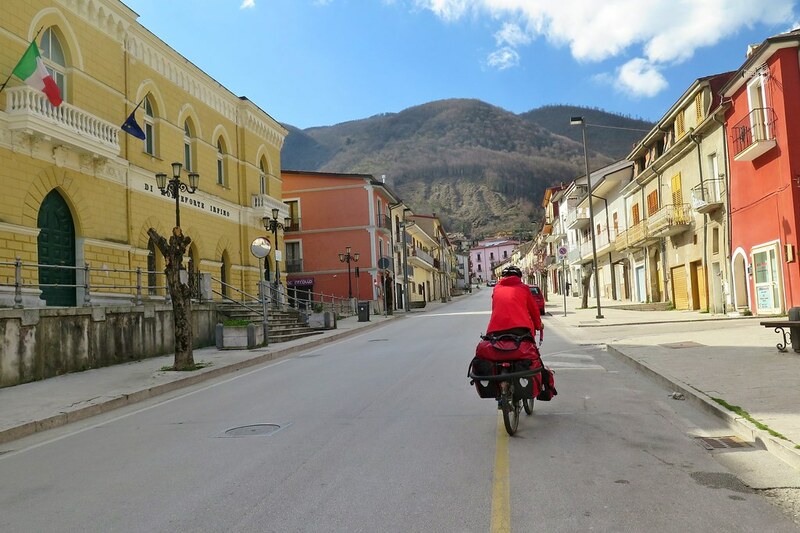 We thought we’d reach Spinazzola by lunctime, but with the extra delays it was late in the afternoon before we passed through the small town so we had to start looking for somewhere to camp. 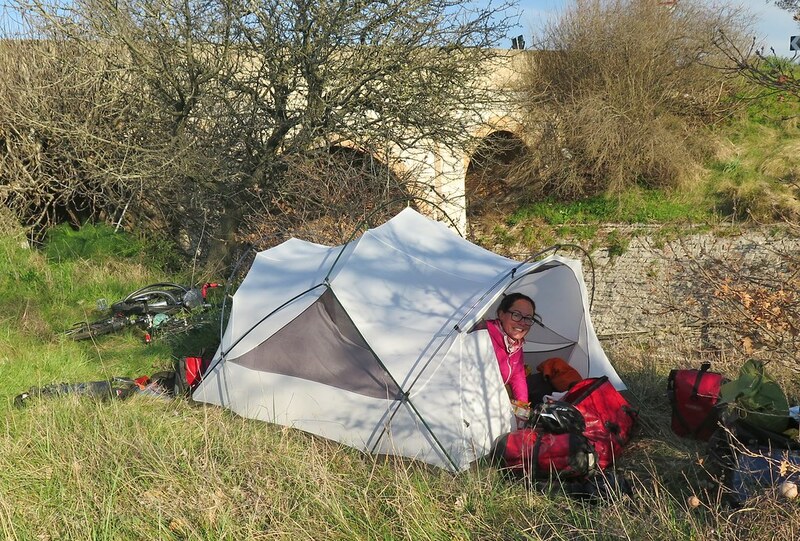 We needed a dry spot and some shelter from the wind, so it took a long time before we found somewhere suitable, tucked away next to a railway bridge. It sounds like a tough day, and it was, but the countryside was so beautiful that we went to sleep exhausted but very happy. The sun was shining brightly the next morning and we’d slept well. 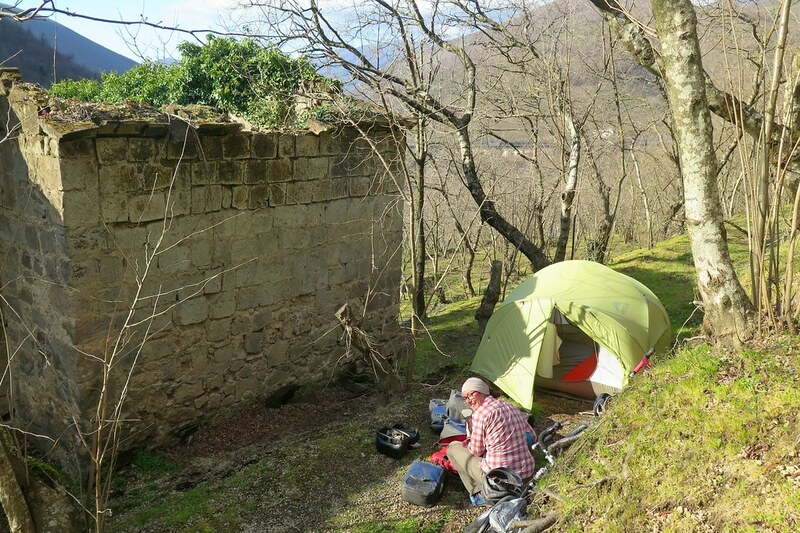 We had been a little unsure about how wild camping would go down here, and how difficult it might be to find spots. With a successful night behind us, we felt more confident about the coming nights, and so far, everything has gone very well. We set off in a good mood, even though the headwind was still blowing hard. We had a series of ups and downs, over ridges and through valleys. 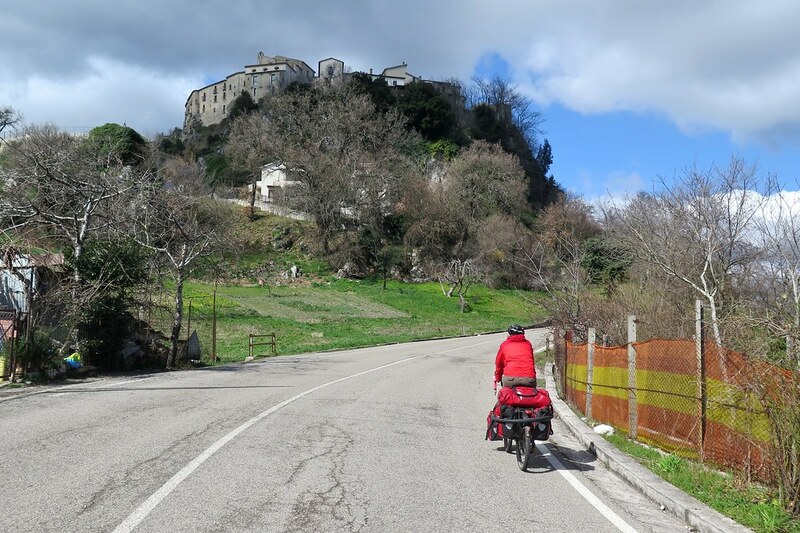 Mid morning we stopped in Venosa, a place that happened to be on our route which turned out to be a classic, postcard image of Italy. 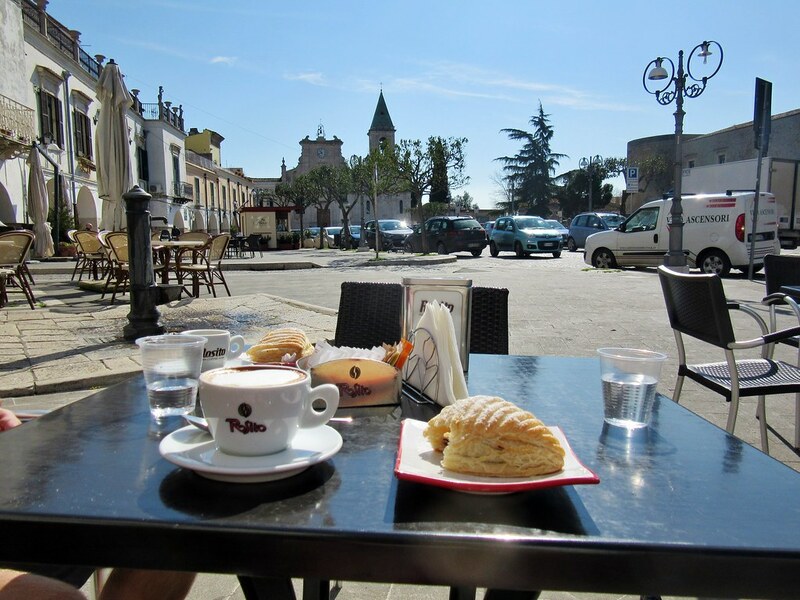 A beautiful cobbled old town, complete with churches, a castle, and a piazza with a cafe where we stopped for a dirt cheap coffee and a pastry. We headed on towards Mount Vulture (1,326m), a dormant volcano which dominated the skyline on such a clear day. We were cycling slow, and doing a lot of climbing, up to 650 metres or so, then back down into the next valley. 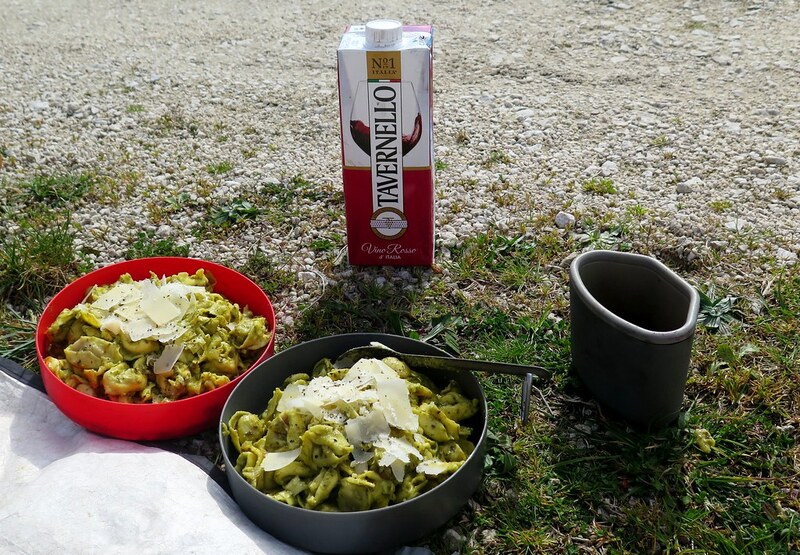 We’ve been taking long breaks and cooking up slightly more interesting pasta dishes for lunch using ingredients from the local shops (and maybe the odd cup of box wine). Then in the evenings as we’re usually finishing a bit later, we’ll just have a fresh loaf of bread and some cured meat and cheese. A definite improvement on instant noodles! 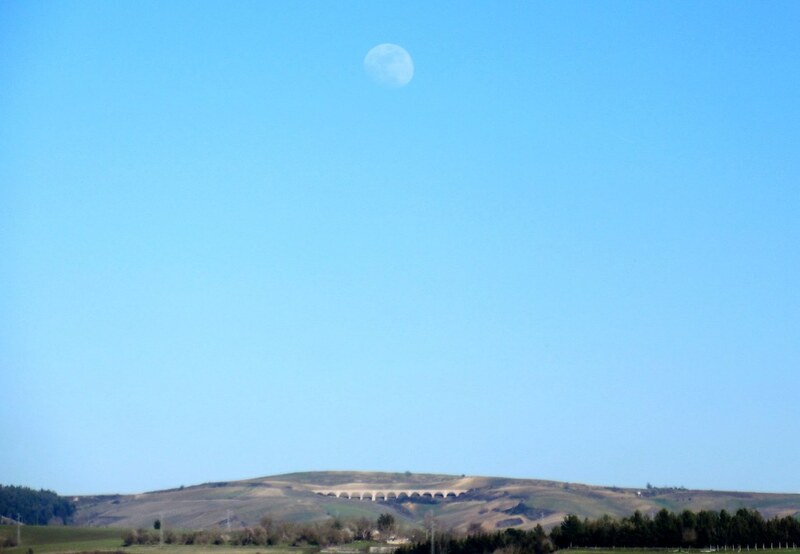 We pitched our tent that evening on a hillside close to a viaduct (lot’s of viaducts around here), overlooking Vulture just as the moon was rising. The sky stayed clear through the night and the temperature dropped well below freezing. 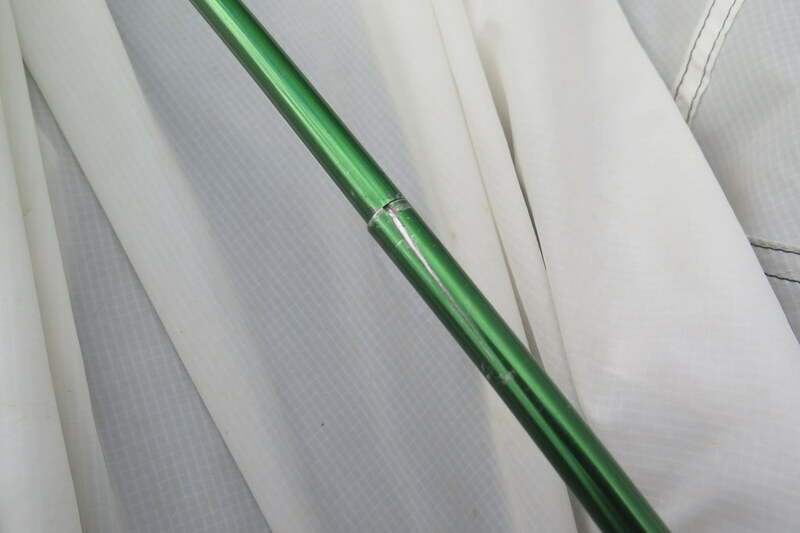 It was quite a surprise to find ice on the tent and our water bottles frozen in the morning. We had a slow start, enjoying the sunshine first thing which dried the tent and warmed us up nicely before we set off. We joined a slightly busier road later in the morning, which was used mostly by big trucks carrying brand new Fiat 500s. The drivers were all very respectful of our roadspace though, giving us a very wide berth when they passed. A few clouds rolled in as we were having our lunch next to Lago di Conza and it felt a bit chillier in the wind. It was comfortable cycling, but we needed an extra layer on as soon as we stopped. We pulled in next to a bank in Lioni and one of the staff popped out to say hello. He asked about our trip and must’ve been pretty impressed, as we were invited inside for a coffee. Then they asked us what clothes size we were (bit forward, these Italian fellas!) and disappeared into a storeroom, returning with a branded fleece each for us. 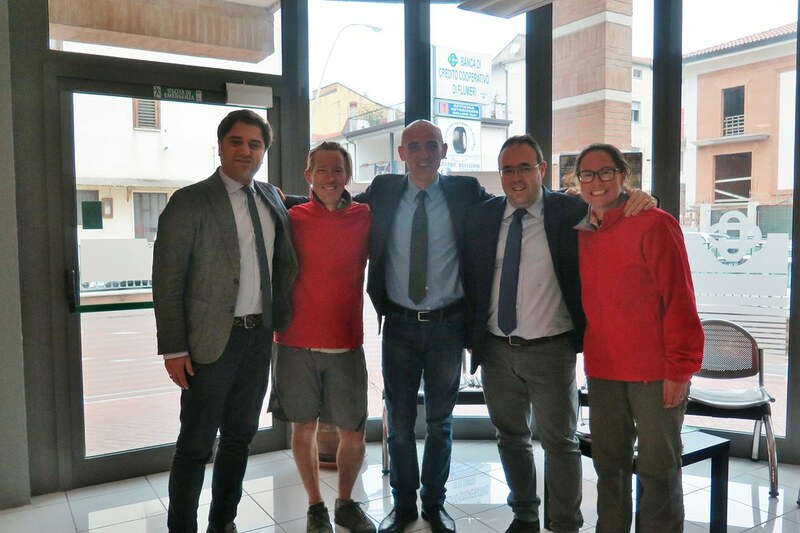 We posed for a photo with them all, and they wanted a shoutout in the blog, so – ‘grazie!’ to everyone at BCC Flumeri in Lioni! Every day we’ve been having such fun and friendly interactions with the locals. We thought that once we were into Europe proper that this kind of thing wouldn’t happen, but it’s been such a pleasure meeting people, especially as we’re able to actually communicate a bit more with some basic Italian. The next day, we were aiming to get as close to Napoli as possible, without getting so far into the suburbs that camping would be impossible. I think we pretty much nailed it. It was a fun day, riding through the hills. 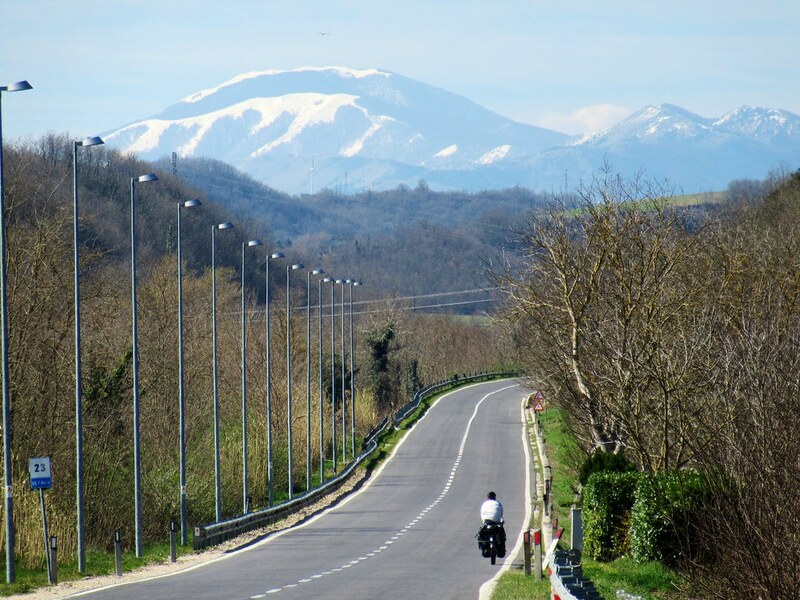 Most of the morning we were climbing, through picturesque hill towns on quiet roads. 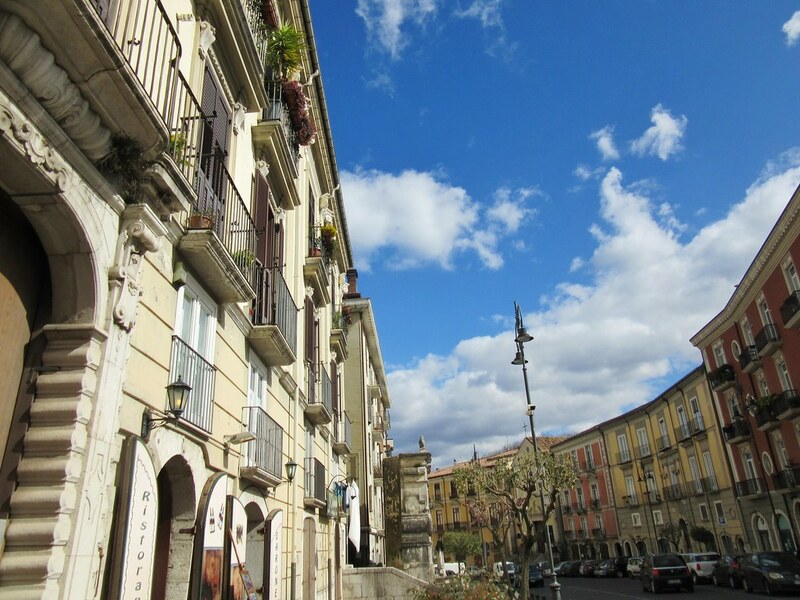 Then we had a long downhill, lots of nice smooth hairpins, into Avellino where we diverted through the old town to stock up at a supermarket and cook some lunch. Leaving town we climbed for a couple of hours, back up to 600m to cross the last pass before the coastal plain. A few kilometres down the far side, we turned onto a side road and then off into a hazlenut forest. A dilapidated farmhouse sheltered us from any potential wind (we were being extra cautious!) and we had a great view down the valley. We said it would’ve been a good property to buy and renovate on Grand Designs. 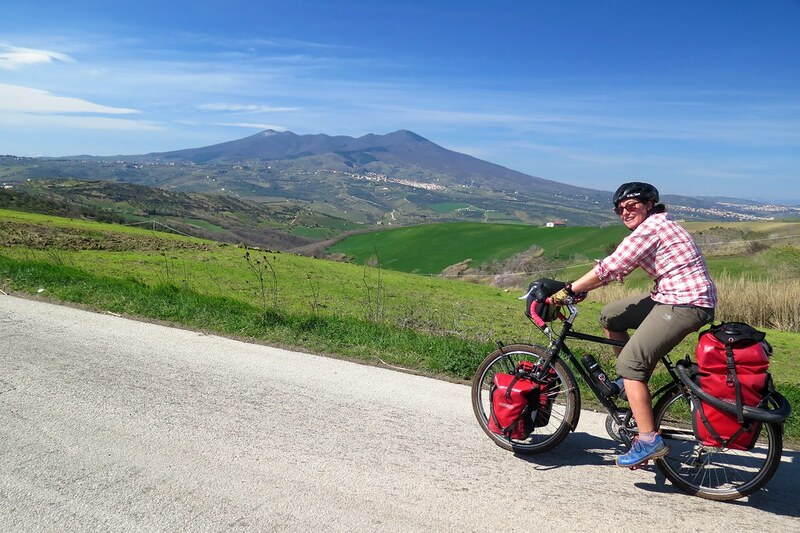 It had the added bonus for us that the first 20km of riding the next day was all downhill, skirting around the slopes of Vesuvius, getting us into the outskirts of the city with barely a turn of the pedals. 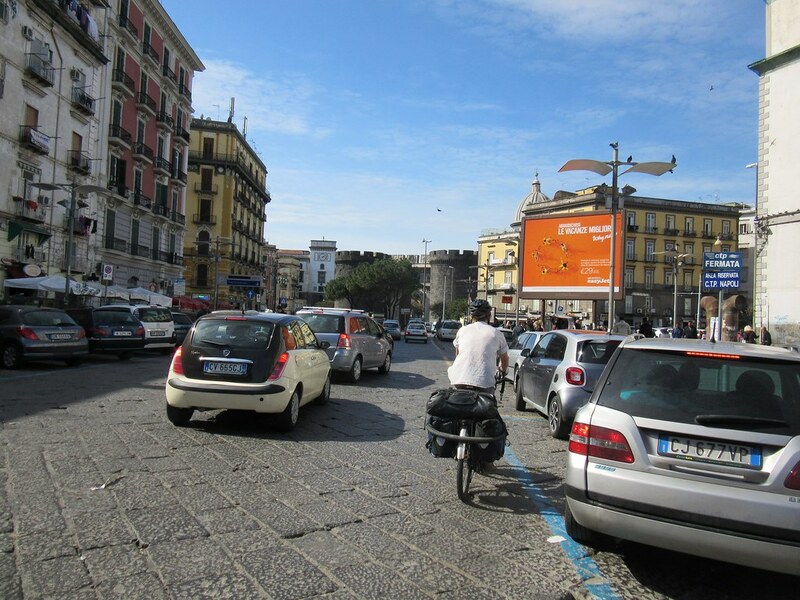 Napoli is Italy’s 3rd largest city, and we were a little nervous about riding into the centre. Maybe (probably) because it was a Sunday and the roads were quiet, or maybe (unlikely) because we’re getting quite competent at cycling into busy cities, it turned out to be pretty easy. We were on quite a high as the sun was shining and we started with a fast and fun downhill. Our road took us right in to a central square where we stopped to have a look at the map. A guy came to say hello and started chatting. 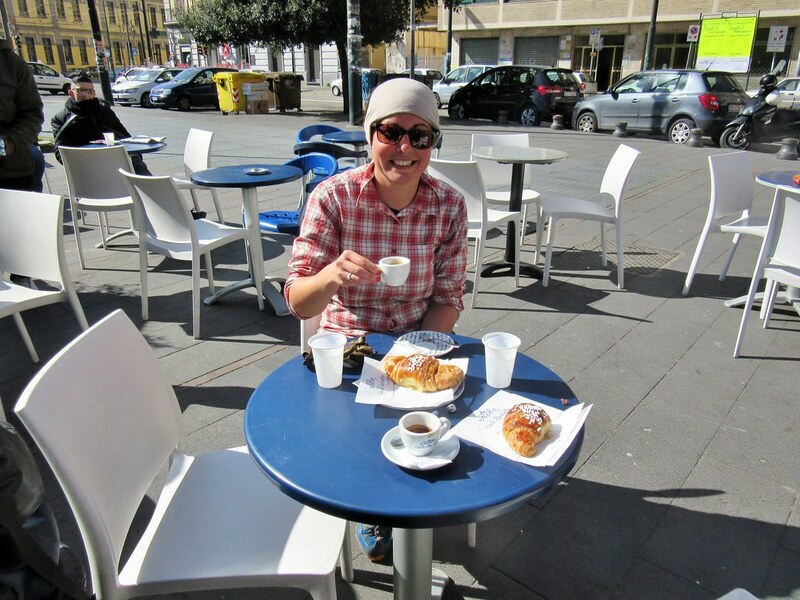 He asked us if we liked Italian coffee, of course we said yes, so he beckoned us over to a cafe where he bought us a coffee and a croissant each. We sat in the sun, loving life (and Italy), humbled yet again by the kindness of strangers. 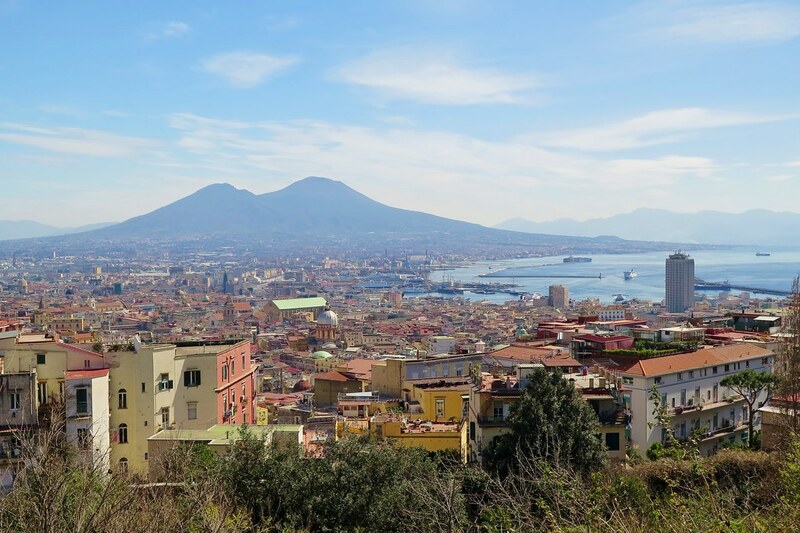 We cycled slowly through the city, working our way towards Vomero, a district up on a hill in the west of Napoli, where we’d booked some accomodation. We were very early, having made such good time, so sat in a park having our lunch enjoying the classic view. 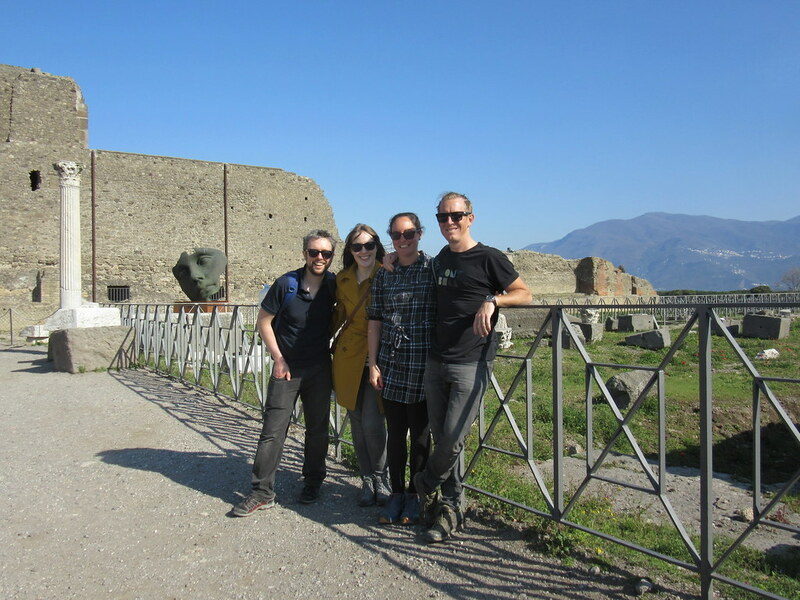 We were approached again by a local guy, Vittorio, who we sat chatting to for about an hour. He’d done a few cycle tours in Europe so was really interested in what we were up to. 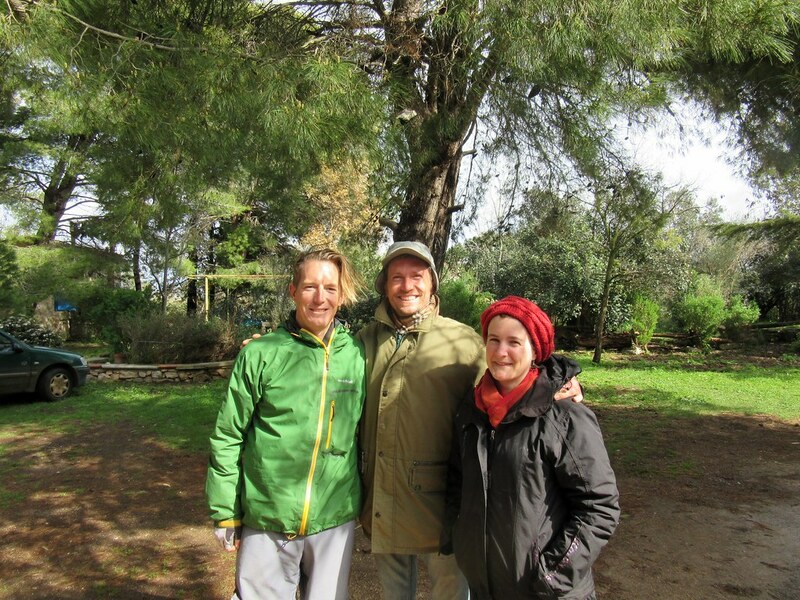 He gave us loads of good tips on cycle routes in Italy, and on good restaurants in Napoli. 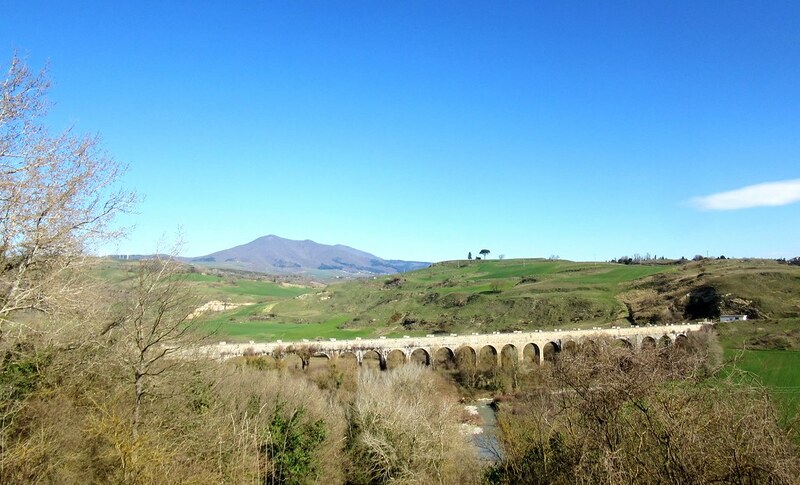 People say the south of Italy is friendly, but this is exceeding all our expectations. If you’ve been following our trip since last year, you might remember we met with friends Todd and Vicky in Siem Reap and then again in Chiang Mai. They’d booked flights down here to meet up and hang out for a few days. (Or, they were coming down to eat pizza and drink wine, and seeing us was just a bonus?) Either way, it was great to see them again and catch up after almost exactly a year. As we did in SE Asia, we ate like kings and drank like fish. It helps that Todd is a chef and a total foodie, so we got the full guide of what was good, local and in season. 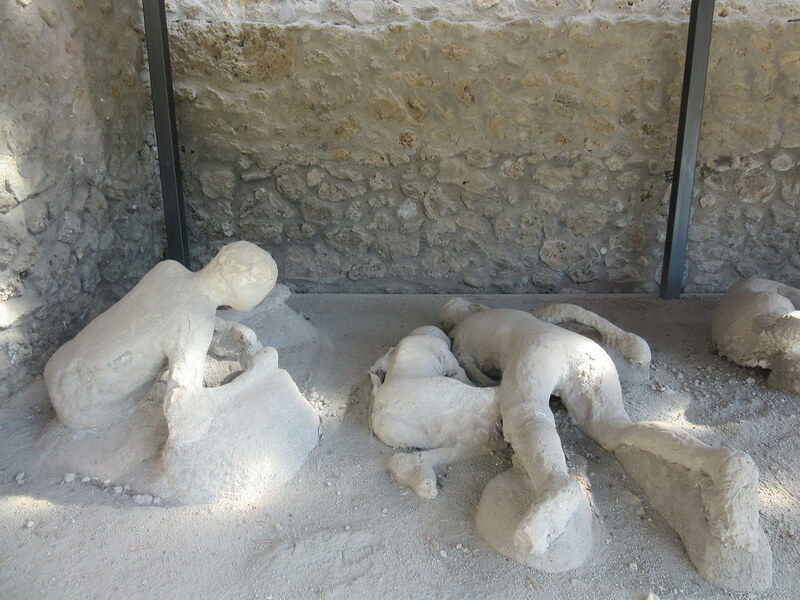 We headed down to Pompeii on the train one day to tick off the token tourist attraction. It was actually really impressive, and well worth the entrance fee. 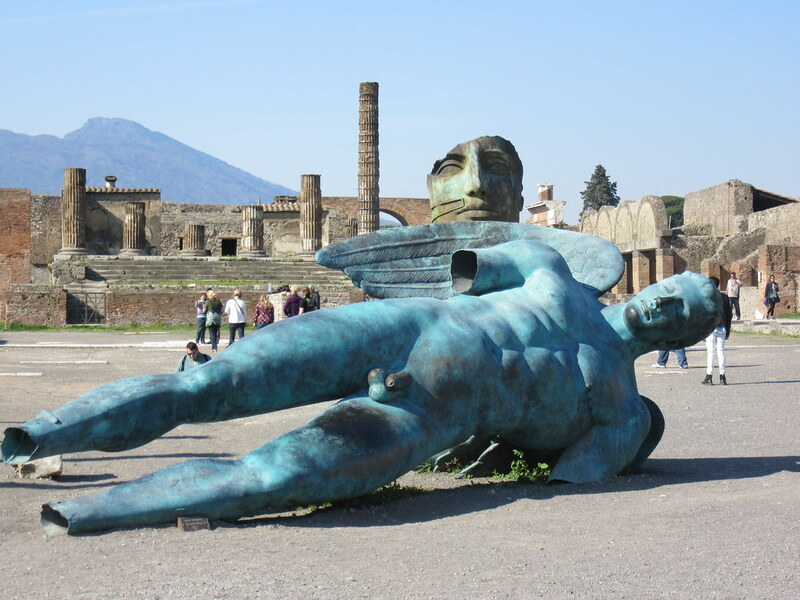 Admittedly, my favourite part was the Pink Floyd exhibit, but the ancient city was something we’d all learnt about at school and very interesting to see for real, especially on such a clear day with Vesuvius looming above us. It’s been an awesome few days off the bikes, a mini holiday with some very good people. We’ll see you soon back on the South Coast, guys. Thanks for coming out to see us. I’ve been joining you vicariously on your travels for over a year now. Yes, it’s true. My calves even ache after some of those long climbs! Anyway, I’d like to recommend a farm stay in Tuscany that Maki and I enjoyed thoroughly a few years ago. It’s called Podere Casanova and it is a working olive farm? Lisa (who loves Japan!) is the charming host there. 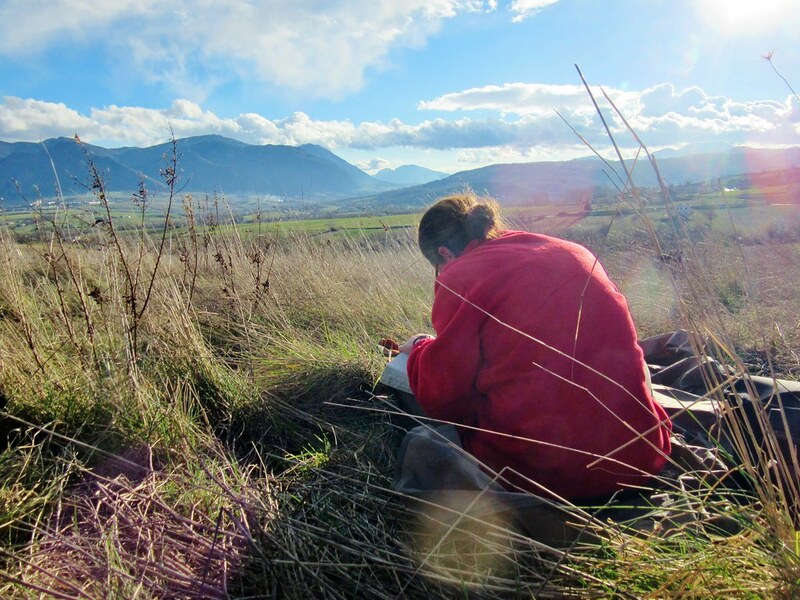 Here is her email address: info@podere-casanova.it or you can find their English website. 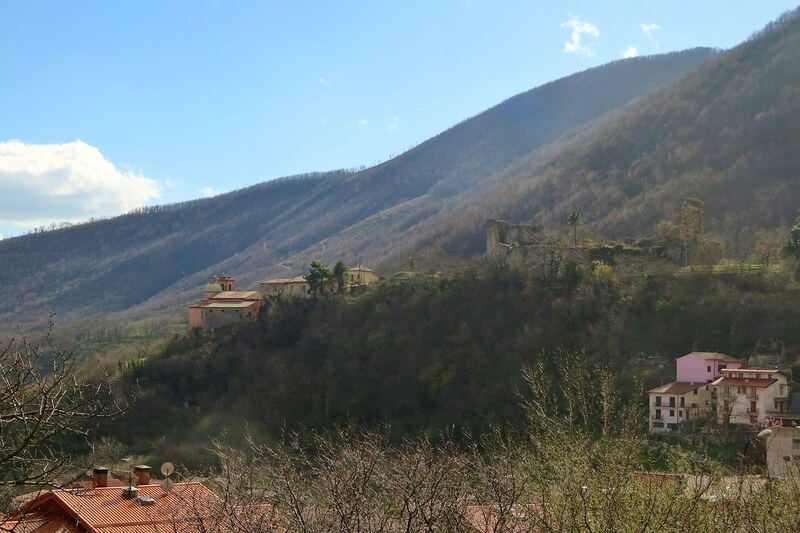 We(I) really experienced the dolce vite there by zooming around the Tuscan hills to the local village market in my red Ferrari (aka Fiat 500 rent-a-car) to partake of its outstanding vegies, ham, cheese, vino and cappucinos. Hope you can do so, too. Hi Ross! Hope you’re well. We’ll check out Podere Casanove if we are in the area, thanks for the recommendation. 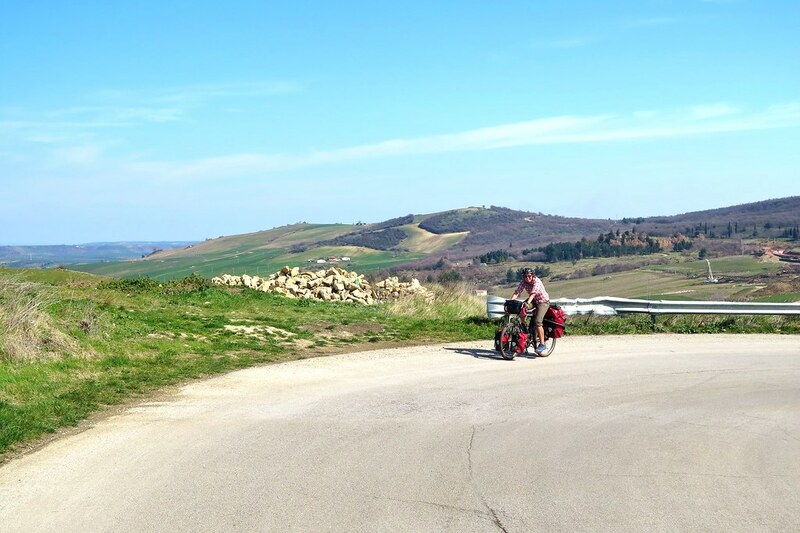 Our Ducatis are definitely enjoying the rural life here in the hills of Italy too!